-- Select a Size -- X-Small - Out of Stock! Small - Out of Stock! Medium - Out of Stock! Large - Out of Stock! X-Large - Out of Stock! 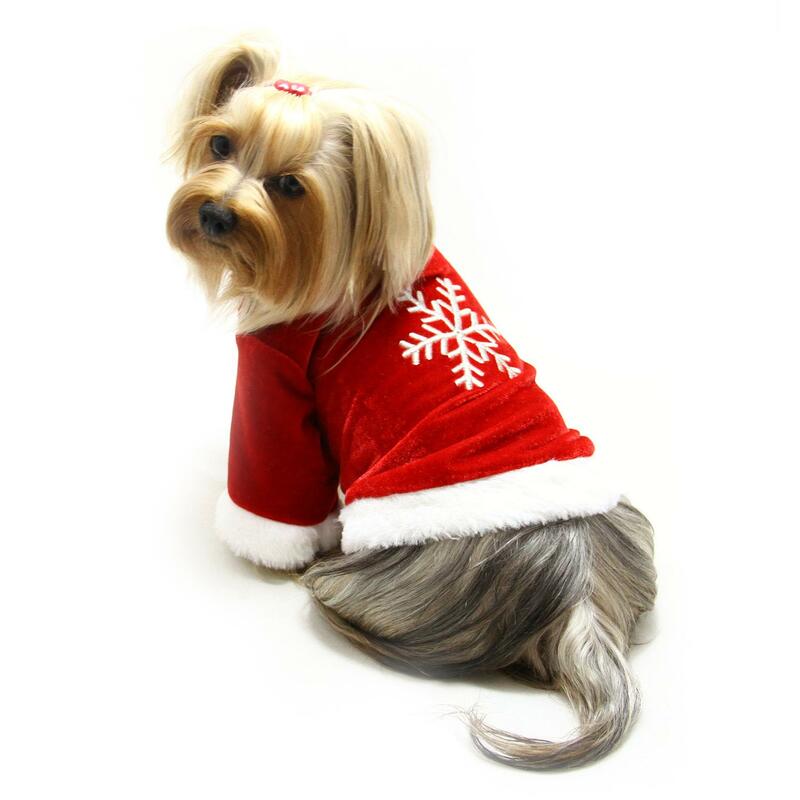 Your dog is sure to impress this holiday season in this adorable Velour Christmas Dog Shirt With Sparkling Silver Snowflake! This dog shirt is made of a soft red velour and is adorned with a large embroidered snowflake in shimmering silver. Accented with white fur collar and sleeve trims and a small D-ring near the neck to add a Klippo charm or ID tag. Each shirt come with a Klippo logo charm. Perfect for holiday events and photos! X-Small: Chest 10-12" Neck 6-7.5" Back 6-8"
Small: Chest 12-14" Neck 7.5-9" Back 8-10"
Medium: Chest 14-16" Neck 9-11" Back 10-12"
Large: Chest 16-18" Neck 11-13" Back 12-14"
X-Large: Chest 18-20" Neck 13-15" Back 14-16"
Posted On 03/08/18 by holli t from Hale, MI Yes, holli t recommends this product! Purchased the red Christmas shirt with the sparkling snowflake in a size M for my 7 lb shih tzu and she looks darling in it except the leg sleeves are a little long so we may have to hem them up. 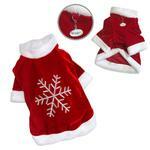 The velour is very pretty red and nice quality and the snowflake on the back just sets it of beautifully. Very nice purchase . I always have nothing but the absolute best experiences with Baxter Boo. They have great products, great prices and super fast shipping. We love them! !